Successfully Added 2-CH Real Time Video + 1-CH Audio DVR Card - Motion Detection to your Shopping Cart. 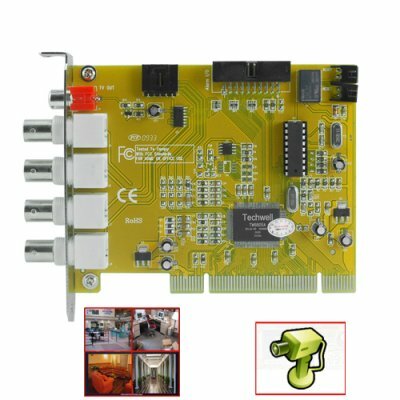 Wholesale DVR card with 4 video inputs, including 2 channels for real-time monitoring and 1 audio input. With this DVR card you can record the video surveillance footage from your security cameras onto your computer for easy record keeping of what is going on in your office, store, restaurant, or even home. Unlike old VCR or disc type recording systems, with a computer and DVR card you do not have to change tapes or media every day. Depending on the size of HDD you have installed, you can continue to record hundreds of hours of continuous video or setup recording schedules that go on for months at a time. You will then have surveillance video files that you can easily backup and archive at your convenience. A very low China Wholesale Price along with Chinavasion's famous 12-month warranty makes this an easy choice for DVR security. The CVAJM-2000FB DVR card with software, exclusively from chinavasion.com! Compatible with channels alarm output, can connect to light, bell, alarm device, etc. The card itself is a PCI card that will work with most computer systems. However, the included software may not be compatible with those operating systems. If you run those OS's, the you may need to find other monitoring and recording software on the internet that is compatible with the operating system of your choice.